Scurrilous wag, half wit, proto marxist, social critic, insufferable cynic or the first great individualist. A bit part in the Iliad has led to a timeless debate. Thersites first appeared as a literary character in Homer’s Iliad. He had a bit part and was a minor interlude in a story of Gods and heroes. Nevertheless he has fascinated writers, critics and the general public for years both for his anachronistic character and ready wit. It all starts with a moment of heightened realism in the Iliad when Homer weaves an intricate web between himself, the poem and the listener. He introduces Thersites in a backhanded way, highlighting his physical defects so as to detract from the potentially insurrectional common sense that he speaks. One feels as a reader that for the first time you really don’t know where Homer stands (morally and personally) on the issue of this character. Homer, as the poet Robert Graves cannily distances himself from the opinions of Thersites by giving him a frightful physical appearance. From this short passage the myth of Thersites begins. One asks oneself, why did Homer include such a character in the Iliad? Thersites was just a common soldier in the Greek army and quite clearly not a powerful handsome hero with divine lineage. But he did speak the truth – with a surprisingly modern twist. The fact that he was beaten and silenced by Ulysses with a royal sceptre is no doubt significant, either to reinforce the aristocratic values that he has mocked or perhaps to reinforce Thersites’s very views, this would depend on one’s own interpretative bent. He highlights the class struggle in ancient Greece, a man fighting injustice and folly with common sense and truth telling. He was one man standing up to the madness of aristocratic tradition on a wasteful ten-year looting and piracy expedition to Troy. Or perhaps he was just glib and cynical and didn’t know his place. Many commentators do see it in just that way that he temporarily forgets his lowly status and as a result gets a well deserved beating. Is he a comic, a social critic or a subtle literary technique to reinforce royal and aristocratic prerogative and privilege? He is not mentioned elsewhere in the Iliad, but in the lost epic entitled Aethiopis Achilles eventually killed him for making fun of his grief over the death of Penthesilea. It is not often in the Iliad that there are two conflicting moral levels. Heroic morals were paramount but here Homer draws us in and allows us to sympathize albeit briefly with some fighting insurrectional talk. Thersites was certainly not alone in his criticism of the war. When Agamemnon makes a fool of himself by suggesting that the Greek army should pack its bags and return home, simply to test its morale, expecting the troops to refute his order as they had not yet had the chance to loot Troy. The Greek army is more than keen to go home empty handed and as soon as Agamemnon makes his cunning suggestion the soldiers are sprinting to the ships sick as they are of a ten-year siege that showed no signs of ending. Thersites had his finger on the pulse but was the only one with the courage to speak his mind and to champion common sense. The modern reader wonders how Thersites ever got by the recruiting officer. One Homeric commentator, the Byzantine scholar Eustathius, suggested that the only reason Thersites was allowed to join the expedition was the fear that if left behind he might incite a revolution! The ancient fabulist Lucian, waxing satiric about Homer’s description of Thersites, says that when the rebel got to Hades he sued Homer for libel. Along with many of the major figures of the Trojan War, Thersites was a character in Shakespeare’s Troilus and Cressida, a grim play of sexual disillusionment. Shakespeare used the character to cut the great heroes down to size and ridicule their posturing. Here Thersites has a fully developed role but he is not the fountain of wisdom and truth but a purveyor of cynicism and contempt, the very lifeblood of the play. He begins as Ajax’s slave, saying to Ajax, “I would thou didst itch from head to foot and I had the scratching of thee; I would make thee the loathsomest scab in Greece.” Thersites soon leaves Ajax and puts himself into the service of Achilles, who appreciates his bitter, caustic humour. The role of Thersites as a social critic has been put forward by several philosophers and literary critics, including Hegel, Nietzsche, Edward Said and Kenneth Burke. In his book Language as Symbolic Action, Kenneth Burke cites Hegel’s coinage of the term “Thersitism,” and he proceeds to describe a version of it as a process by which an author both priviledges protest in a literary work but also disguises or disowns it, so as not to distract from the literary form of the work, which must push on toward other effects than the protest per se. “The Thersites of Homer who abuses the kings is a standing figure for all times. He does not get in every age . . . the blows that he gets in Homer. But his envy, his egotism, is the thorn which he has to carry in his flesh. And the undying worm that gnaws him is the tormenting consideration that his excellent views and vituperations remain absolutely without result in the world. But our satisfaction at the fate of Thersitism may also have its sinister side”. Homer shows a distinct class bias in his very description of Thersites. Homer can be touching and affectionate in describing common folk, even swineherds and slaves, provided that these common people “know their place.”‘ Toward Thersites, who didn’t, the aristocratic bard shows no mercy. 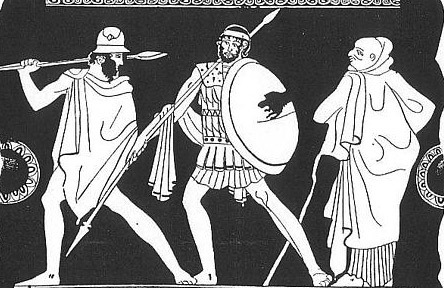 No other character in Homer – not even the cannibal Cyclops – is pictured more repulsively than Thersites. Thersites may have merely been an undiplomatic teller of truth, a common man impatient with the pretensions of a posturing aristocracy given to pursuing folly, but he should be celebrated by history for he dared to speak the universal truth that mankind’s most esteemed political leaders, all too often, have simply been damned fools, vain Pied Piper’s leading better men from one disaster to another.